"These drugs should only be used to treat infections." That applies to people and animals, which, as the graph clearly shows, are closely connected -- even for people who don't eat meat. These drugs should not, as the National Pork Producer Council would have us believe, be used in livestock facilities for "treatment of illness, prevention of disease, control of disease, and nutritional efficiency of animals." And yet, as Tom Philpott emphasizes on Mother Jones, that's exactly what's happening. 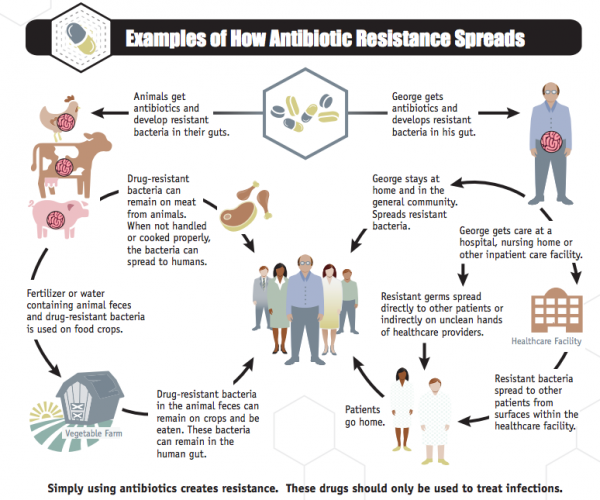 Also happening: drug-resistant campylobacter, drug-resistant salmonella and MRSA, all of which can be linked to the inappropriate use of antibiotics in livestock.